The case is available in either Red Oak or stained Walnut, and comes with a red, blue, green or black background. 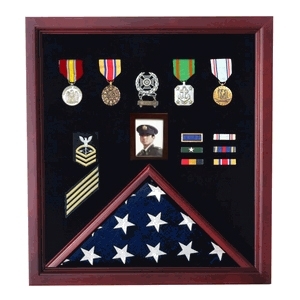 The flag display portion of the case will hold a United States Flag sized for a coffin and given to relatives at funerals. This flag comes sized 5×9, and when folded, fits perfectly behind the display glass.